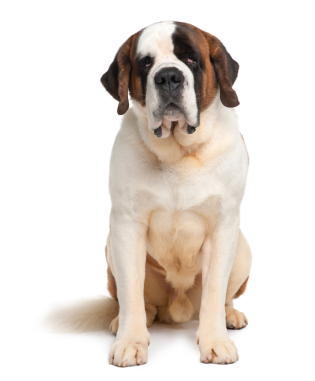 Learn about the temperament and personality of the Saint Bernard. Discover what he's like to live with, his traits and characteristics and how he generally behaves. And look at lots of Saint Bernard photos. Saint Bernards are awesome family pets if you don't mind having a gigantic dog being part of your family, if you don't mind a lot of slobber, if you don't mind a lot of fur, and if you don't mind a dog who can clean off the dinner table with his tongue. Saint Bernards are famous for how good they are with children. They seem to have an innate understanding for how children think and behave, and are incredibly patient with them. They are gentle with little ones, and go out of their way not to hurt them. A Saint Bernard owner will have to protect his Saint Bernard from the children, as they might try to ride him like a horse! A Saint Bernard is intelligent, and incredibly strong, so you need to start obedience training when they are young! They will learn bad habits just as efficiently as they will learn good ones, so you do not want a giant, strong dog running your house! Some can be overly guarded and possessive of their property. They aren't that easy to train as they can be independent, and occasionally stubborn. They are quick to housetrain, however. 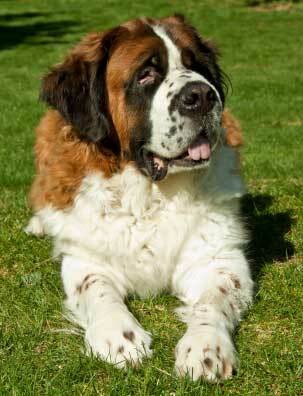 Saint Bernards were bred to be search and rescue dogs, and they need daily exercise and mental stimulation. However, they are not terribly active dogs, so they will need some incentive to exercise. Toys may or may not interest them so that incentive usually ends up being you. (Also be aware that abrupt changes of temperature are really hard on this breed, so be careful taking him from an air-conditioned couch out onto a steaming hot sidewalk!) They will need a fenced-in yard, and invisible fences do not work well with this breed. They make good watchdogs, as they are protective of their family (sometimes they can be overly protective). Their intimidating size can scare off evildoers which may make them a good guard dog. They are good with other dogs and usually ignore cats. So, if you are in the market for a giant best friend, a sweet, patient and gentle new family member, and a tail that loves to smash knick-knacks off the table, the Saint Bernard is probably for you. Just be prepared that they are as big as you are. And he will want to sit on your feet, lie in your lap, and lean against your leg. They are rowdy and exuberant when they are young, and laid back and calm when mature. The Saint Bernard is harder to train than most other dog breeds. He learns new commands more slowly than the majority of other breeds. You will need to be extra patient when Training him. The Saint Bernard is a very heavy shedder. He sheds an awful lot of hair! You'll find hair all over your home, stuck to everything! You'll probably even find it in the butter!